1.5 HP AC This large-frame AC motor stays cool through the toughest workouts. It creates high levels of inertia for a smooth, powerful feel,and promises a quiet in-home experience.This motor is built with high grade components proven for long run under stablized Power condition. 48″x23″(1200x565mm) Because your in-home workout experience should be a comfortable one, In this treadmill you can walk, jog, and run. length gives your legs plenty of room to stretch out your stride extra elbow room. To ensure our treadmills are top quality, we test each belt for one million cycles at Heavy weight user. 1-14 km/hr But it’s nice to know this treadmill can totally handle it. Thanks to a bigger motor size it rocks at top speed of 14 kmph. The convenient Hand Speed buttons let you adjust your intensity instantly, so you can stay focused through every step of your workout. You can watch your Distance covered, speed, calorie burn, heart rate, and time.It feels good to know you’re getting stronger each day. 4.5″ LCD Display. Inventor Technology is proven to be the best in giving right power based on usage & save power during idle time.We use high quality components in drive & display are manufactured in accordance to ROHS certification. When you run at a top speed ,we care about you and provide this safety key option,which stops the treadmill running by a fraction of sec just a pull is enough.The Overloaded trip switch provided to safe guard the motor/drive under uneven load because of power(or)externaal particulars. SDS system help reduce the impact that transmits to your knee and angle and hip,It gives you smooth running experience. 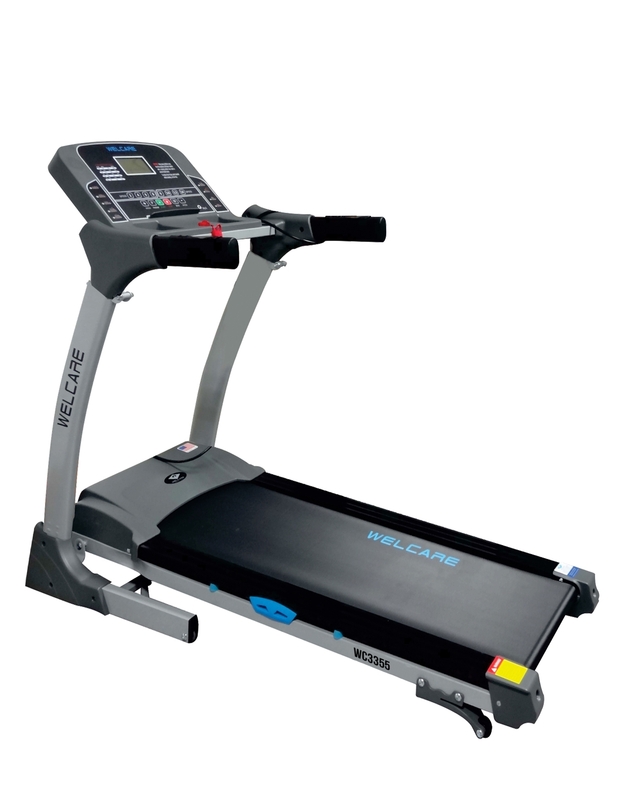 Welcare Treadmills built perform better.It helps you run extra mile because of the smooth landing & less impact to knees.Compared to traditional. We know you like your house to be clutter-free. So we designed a treadmill that folds up and out of the way when you’re done with your workout. we’re just glad you don’t have to sacrifice your living space for your fitness habit anymore. And as an added bonus, we built in a powerful shock that helps you lift the deck with an easy push.We use Hydraulic cylinder to make it happen. Just like that,ON your single touch the speed can be increased or decreased.You are provide with short cut key for immediate changes of speed&incline according to your comfortness.